Displays of architectural components — balustrades, window-frames, garden bird-baths — are not an uncommon sight on the outskirts of many Caribbean cities, outside hardware and construction-supply stores. 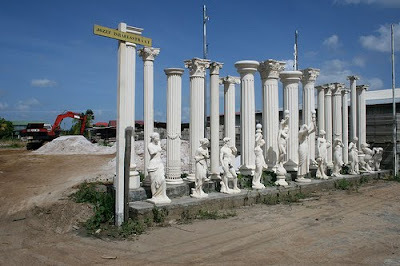 But the array of concrete columns and reproduction statuary photographed by Christopher Cozier on the outskirts of Paramaribo is particularly impressive. The columns seem to include all the orders known to classical Greek architects — versions of the Doric, Ionic, and Corinthian — and the row of statues features concrete reproductions of the Venus de Milo and Michelangelo’s David, an Art Nouveau caryatid, and a rearing horse, all carefully lined up on a pair of stepped ledges at the side of a dusty road. 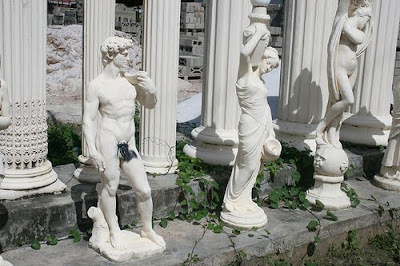 Their pristine white finish is marred only by a blotch of spray-painted black on David’s crotch, at once drawing attention to and obscuring the anatomy. A vandal’s prank, or a businessman’s gesture of modesty? Intended to dress up the façade of a prosperous mansion, or raise the style of a more humble bungalow, these concrete objects suggest aspirations of grandeur that may seem out of place in Paramaribo’s suburbs. But looking at the photographs I was reminded of the marble bust — probably of nineteenth-century provenance, and imported from Europe — which I’d earlier seen outside the ramshackle estate house at Alliance, a plantation on the Commewijne River east of Paramaribo. 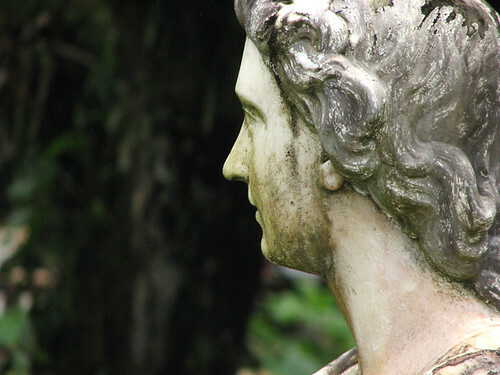 Perched on a baroque stone pedestal, now weathered and streaked with moss, the Alliance bust tells a story of the social and cultural aspirations of another generation. And the concrete columns photographed by Cozier on Jozef Israelsstraat are less “authentic” but certainly more durable versions of the classical details rendered in white-painted wood on the façades of many nineteenth-century buildings in central Paramaribo. 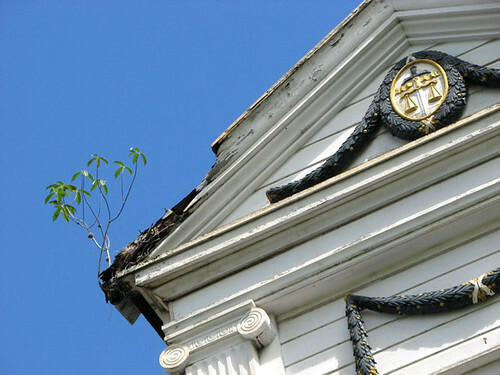 But whereas the faux-classical concrete decorations on a modern mansion will likely endure until the householder’s tastes change, the façades of Paramaribo’s heritage buildings, recognised by UNESCO and protected by law, require restoration and renewal every few decades. In the tropics, wood decays fast, even under a coat of white paint.